Built by Boeing at Seattle. On July 24, 1942 Delivered to the US Army Air Force (USAAF) as B-17F-20-BO Flying Fortress 41-24520. Ferried overseas via Hickam Field across the Pacific to Australia. On September 7, 1942 assigned to the 5th Air Force, 43rd Bombardment Group, 63rd Bombardment Squadron based at Mareeba Airfield. On September 16, 1942 assigned to the 403rd Bombardment Squadron and soon afterwards returned to the 63rd Bombardment Squadron. Assigned to pilot Lt. Folmer J. Sogaard with crew chief Laird. Nicknamed "Fightin Swede" in honor of Sogaard who was of Swedish decent. The nose art had a pair of boxing gloves hanging off the top edge of the first letter. On September 14, 1942 took off from Mareeba Airfield on the squadron's first combat mission flying to 7 Mile Drome near Port Moresby on an armed reconnaissance mission. On September 29, 1942 took off from 7-Mile Drome near Port Moresby piloted by Lt. Folmer J. Sogaard armed with 500 pound bombs with B-17F "I Dood It / Pluto" 41-24543 departed in a storm on a mission to bomb a light cruiser reported off Buna. Searching for two hours in the storm without results, they were notified the report was in error and instead bombed Buna Airfield and were fired on by anti-aircraft fire that put a hole in the right wing and two holes in the left wing but both bombers returned safely. On October 25, 1942 took off from 7 Mile Drome piloted by Captain Scott in the early morning on a reconnaissance and bombing mission against Japanese shipping in Simpson Harbor off Rabaul and was joined by seven other B-17s. Afterwards, returned to Mareeba Airfield. On November 14, 1942 took off from 7 Mile Drome piloted by Captain Sogaard with navigator Lt. Ahl at 10:30am on a mission to fly a weather mission ahead of eight P-38 Lightnings from the 39th Fighter Squadron plus a B-17 from the 19th Bombardment Group on a flight to Henderson Field on Guadalcanal arriving at 2:50pm. After being refueled this B-17 departed at 4:00pm flying back to 7 Mile Drome landing at 9:30pm after a ten and a half hour flight. On December 18, 1942 one of six B-17s that took off from 7-Mile Drome piloted by Captain Sogaard on a search mission. Over Astrolabe Bay this B-17 was the first to spot a convoy of four destroyers, two transports and a light cruiser off Madang. Intercepted by five Zeros that hit the no. 1 engine, and salvoed his bomb load to lighten the damaged bomber. Protected by B-17 piloted by Lt. Murphy, both bombers drove off the Zeros and returned safely. On January 20, 1943 this B-17 was scheduled to fly to 7-Mile Drome but while taxiing on the ground collided with B-17F "Tojo's Nite Mare" 41-24357 delaying the movement for a day. On March 4, 1943 during the Battle of the Bismarck Sea one of three B-17s that took off from 7-Mile Drome piloted by Dieffenderfer on a bombing mission against Japanese shipping. Finding no targets, but observing wreckage and lifeboats and rafts. All three B-17s dove to low level and strafed the lifeboats and barges for 30 minutes. During the attack, this B-17 was intercepted by two Ki-43 Oscars that made a frontal attack, shattering the nose perspex glass and wounding the Blair and Grosenburg with glass fragments. Dieffenderfer was also grazed by a bullet on his elbow. On April 19, 1943 took off from 7 Mile Drome near Port Moresby piloted by Captain Folmer J. Sogaard, Jr. with radio operator TSgt George Prezioso on a bombing mission against Japanese shipping off Wewak. Over the target, this B-17 successfully skip bombed a tanker that was hit and left "burning fiercely" and "definitely sunk", then bombed Wewak Airfield. 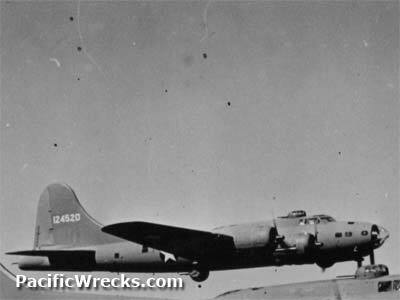 Also on the mission was B-17F "Talisman" 41-24537 that claimed two "very near misses" on another ship. On May 8, 1943 took off from 7-Mile Drome near Port Moresby at 6:40am on a armed reconnaissance mission to Madang and Saidor on the north coast of New Guinea. It is reported that a U. S. Army Lieutenant was also aboard this plane. He is not listed above, nor is there any mention of his presence in Missing Air Crew Report 13689. It is unclear if there was an extra crew member aboard or not. This B-17's last reported position was 50 miles north of Madang when it reported a small Japanese convoy at 9:00am, then never reported again. When this bomber failed to return it was officially reported as Missing In Action (MIA). In fact, at 9:13am this B-17 was spotted by three Ki-43 Oscars from the 11th Sentai, 1st Chutai escorting the convoy and made at least two head on passes against the bomber that caused the engines to smoke. Next, the B-17 was intentionally rammed by Ki-43 Oscar piloted by Tadao Oda who was himself killed in the ramming attack with both aircraft bursting into flames and crashing into the sea. "...nine Type 1 [Ki-43 Oscar] fighters of the 11th FR under Capt. Takashi Ninomiyo, commander of the 1st Chutai. These encountered the B-17 while en route to cover the ships. Three Type 1 fighters under Lt. Junji Kobayashi broke off and attacked the B-17 initiating their first pass from slightly above and then completing additional head on passes. Though damaged, the B-17 headed for some of the clouds and rain squalls in the area. Unwilling to let the B-17 escape, Sgt. Tadao Oda commenced a head on pass that ended in a collision. Both the B-17 and the fighter fell into the sea in flames. There were no survivors. The Americans had no idea what happened to the B-17 flown by Lt. Robert Keats and his crew. Oda was lionized in the Japanese press for deliberately ramming and destroying the big bomber. He was promoted to Lieutenant posthumously." "One more bit of data. I found an account that states the ramming took place at 0813 (Tokyo time). That would be 0913 (US time). This leaves only about 13 minutes flying from the last B-17 contact report. A possibility: At about 3 miles per minute (180 mph) that means the B-17 was probably less than 40 miles from its final contact report position. Moreover, since the B-17 probably maneuvered after sighting the Japanese fighters it was quite possibly not that far. While we don't know in which direction the closest cloud cover was, they were unlikely to head deeper into Japanese territory or much farther out to sea (my guess) so near the coast and not as far as 40 miles further NW is one possible location for their demise. Everything in the second paragraph is speculation but thought I'd throw it in for what it may be worth"
Afterwards, some members of the 63rd Bombardment Squadron heard that Radio Tokyo reported an incident on May 8 1943 when a Japanese fighter pilot rammed a B-17. This led to speculation that this was the cause of the otherwise unexplained loss of this bomber. Afterwards, searches afterwards and postwar yielded no sign of the crew or B-17. The entire crew was officially declared dead on December 17, 1945. All are memorialized on the tablets of the missing at Manila American Cemetery. Posthumously, Keatts was promoted to Major. "I am the niece Cpl. John T. Mannion. He arrived in the South Pacific in August of '42 as a crew member of one of a group of 11 B-17s that flew from San Francisco to Australia. My uncle was a radio operator and flew as a member of different crews over the ensuing months. He began flying with Capt. Robert Keatts in March of 1943. 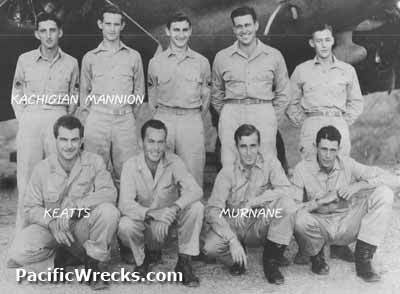 "24520 (*Fighting Swede*) lost May 8, 1943 on mission to Wewak. MACR 15689"
American Battle Monuments Commission (ABMC) - Frank D. Goodwin Jr.